How are you enjoying the Tonic Pick of the Week so far? Craig has settled into the demos and being in front of the camera like an old hand. I`ve used the Purple Empress set of dies. The flowered paper is from Lili of the Valley. The sentiment is stamped and embossed in silver. I`ve had it for many years, but can`t remember who made it. I just love the font, it matches so well with the flourishes in the dies. I`ve added a bit of glitter to the die embossing. The flowers are from the Petal Pairs punch set. The coils are made from a thin strip of paper wound around a small paint brush handle. 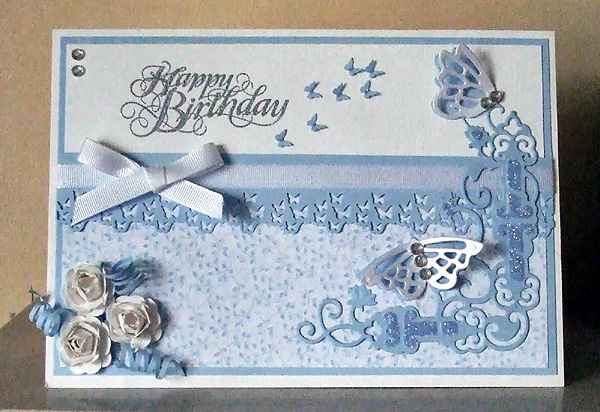 The border is the butterfly made using the Butterfly Border punch and I`ve added a few of the punched out butterflies. Of course I had to add a ribbon & pearls. Hope you get a chance to catch up with Jodie & Craig on Create & Craft this week.